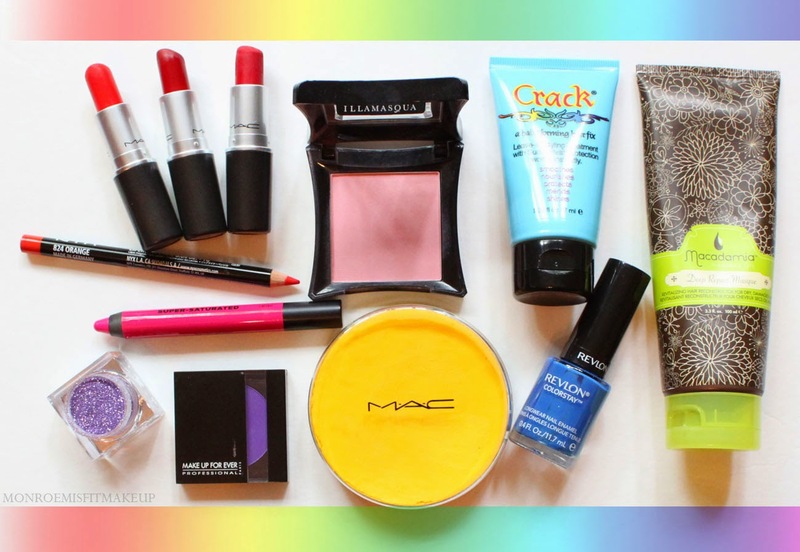 Monroe Misfit Makeup | Beauty Blog: The Colors of the Black Rainbow - Favorite Beauty Product's by Color! RED - No surprise here, Red Lipstick. I couldn't choose between my 3 well loved MAC Red's: Ruby Woo , Russian Red , and Lady Danger . ORANGE - NYX Lip Pencil in Orange. Finding a truly orange lip pencil has been almost impossible, problem solved with this one from NYX. It's the perfect orange, not a hint of coral or pink in sight. 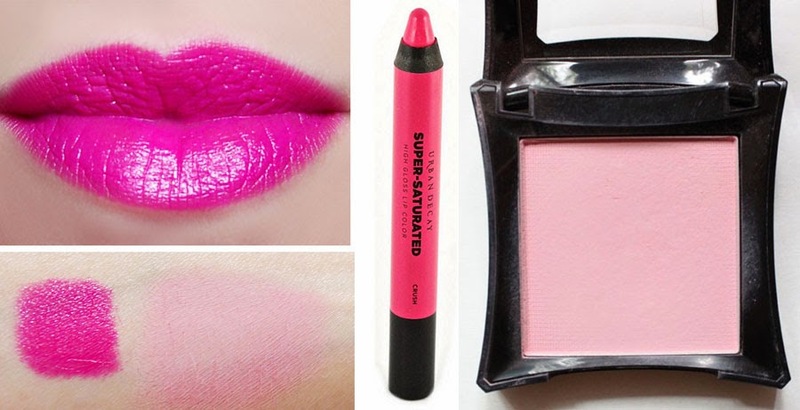 HOT PINK - There's many hot pink's that are dear to me but I wanted to share one I haven't blogged about before, Urban Decay Super Saturated Lip Color in Crush. UD is probably most known for eye product's but their Lip offering's deserve just as much praise. Crush is a sick as hell bright hot pink. The medium pencil applicator makes it so easy to do a bright lip on the go. It applies so smooth and color rich that you really only need a couple passes to get full coverage. It may look like your average glossy balm pencil, but this one is packing serious long-wearing intense color. LIGHT PINK - Illamasqua Blush in Katie. Katie is a delicate light candy pink sans shimmer that looks lovely on pale complexions. Illamasqua makes supreme blushes no matter what shade you choose. YELLOW - MAC Chromacake in Yellow. 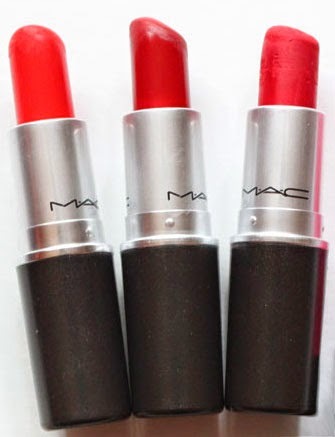 I'm not sure if chromacakes are still available at mac pro, but I love the ones I have. They're huge! and make excellent bases, for use on the body, and as graphic eyeliner. 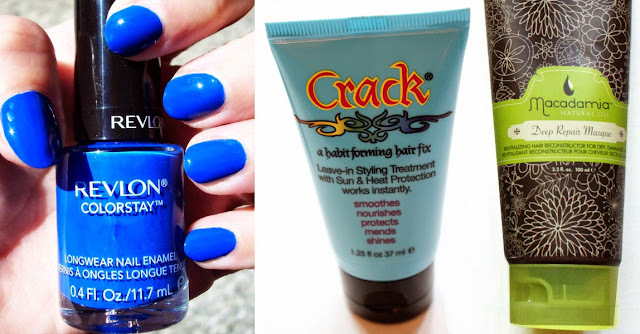 INDIGO - Revlon Nail Polish in Indigo Nights. I don't stray from my mainstay's of red, pink, and black too often but this creamy deep cobalt shade is pretty nifty. BLUE - This is your hair on CRACK! ! A habit forming hair fix that's one of the most effective product's in my styling routine. I apply this leave in conditioning cream just to the ends of my hair and it combats frizz and holds up to humidity. My ends are dry from all the torture i put my hair through, the moisturizing Acai extract and silk protein bonds to them making them look not so destroyed. It's also UV and heat protective. GREEN - Green is one that stumped me. I was about to roll out with a day-glo green eyeshadow and realized I'll never wear green eyeshadow again in my life so that doesn't qualify as a favorite. In all honesty I wasn't impressed by the Macadamia Natural Oil Hair Line, except for this one product. The Deep Repair Masque , it does wonderful things to your locks. My hair feels so soft and hydrated after I use this and it smells soooo good. I wish I could find an everyday conditioner that works this well. VIOLET - LIT Cosmetics Twisted Sistah Glittah. Lit makes the best cosmetic glitters in a ton of different colors and cut variation's from ultra fine to thick. If you want sparkle that stays put, don't be with out the glitter adhesive, it's bulletproof. PURPLE: Another color I had a hard time with because I'm allergic to purple eye makeup, but I will suffer for the cult classic Make Up Forever #92 eyeshadow. 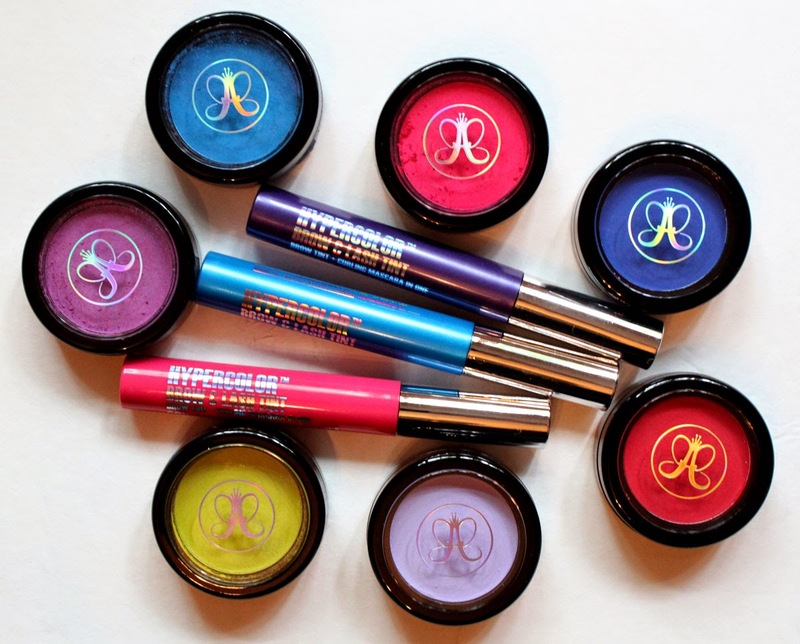 MULTI-COLOR - Finally all the shade's of the rainbow goes to the Anastasia of Beverly Hills HYPERCOLOR Range. These powder's (reviewed here) are an exciting way to spice up your hair color (and really feel like a goth teenager again!) and the colored mascara lash tint's are just as vibrant on the lashes as they are in the tube. Anastasia has also just released 3 new colors of hair powder's Seen on the far right: Lola-Lilac, Red-licious, and Royal.